Due to an overwhelming workload in Sweden we have not had time for tropical Dokmai Dogma blogs. However, we paid a swift visit to Dokmai Garden in Chiang Mai this July, and so we wish to share some impressions. We arrived in the midst of the El Niño drought, but since we have experienced such droughts before we were not worried, confident our selection of hardy plants would survive like last time. In fact we eventually received some 20 mm of rain, and in two days the landscape changed into a jade green, although teaks and other deciduous trees had already decided to shed their leaves. Flowering trees which normally display their beauty in the (normal) drought of April started flowering all over again (e.g. Delonix regia and Cassia fistula). The garden was full of birds and butterflies, including the endangered golden birdwing butterfly. Neighbours had noticed this island of life too. Of course they wanted to know how to achieve such biodiversity. The answer has been hinted in Dokmai Dogma blogs before; establish a broad range of plant species providing shelter for birds, food for butterfly larvae, fruit, pollen and nectar, and stay away from fire and pesticides! We were also pleased to see that the quarry still contained water in spite of the drought, and there were still plenty of native fish, many of which have become quite large (e.g. giant gourami). During rainy La Niña years the quarry fills up, but Dokmai Garden is naturally drained so unlike the rice field areas around town we are never flooded. In addition to the wild fauna, Dokmai Garden has new zebu cows, many white ducks and many more chicken including black-skinned (white-feathered) chicken. 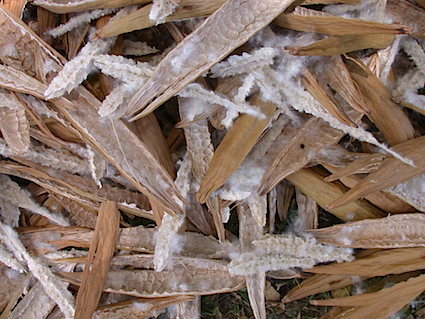 The sheep have become mutton, as they destroyed many plants, including treasured bananas. To our great joy most of the orchids that were mounted in the trees until 2013 have survived and many are naturally reproducing. 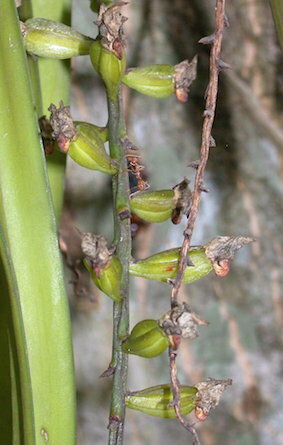 One example is the orchid Aerides multiflora, which never produced fruit until this year when we counted 57 capsules! This hints that the garden keeps evolving and attracting more species, including the elusive pollinator of this orchid. Although we lost the Mediterranean plants which apparently needed Eric’s love and care, the native monsoon trees have grown rapidly. The payom, Shorea roxburghii, which has a valuable timber and is one of the best natural substrates when orchid seeds germinate, have grown to such an extent the five trees confused our orientation. They seem to have doubled their size in 18 months! The Benjamin fig, Ficus benjamina, has grown at an amazing speed too. 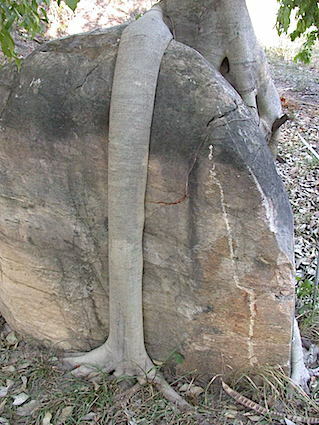 A tiny seedling which originally germinated on a log was fastened to a rock six years ago, and its roots dispersed to eventually create a giant claw grasping the rock. 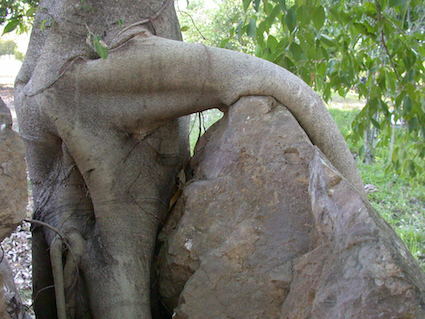 This strategy has worked very well because the current impression of this fig tree is that of liquid roots. They look like they were made of melted metal. The ebonies are getting taller too, and we had a bountiful crop of santol fruit (Sandoricum koetjape). We also admired the height and health of the little known native tree Protium serratum. 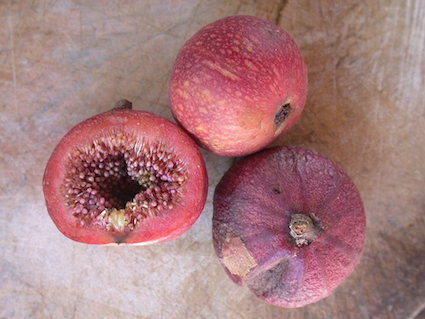 Although we could see its edible fruits, they were still immature. Many more delicious and rare fruits are expected over the coming years. The local climate of the garden is much cooler today thanks to the unbroken canopy of the monsoon woodland in the southeast. Humans can no longer reach the lowest branches in many trees, and like proud parents we remember that in June 2006 this entire woodland was gathered as seedlings in the back of our car! The native but rare rosewood (Dalbergia oliveri) has also grown rapidly. We should strongly recommend planting this native and gorgeous tree in Chiang Mai. Not primarily because of its valuable and beautiful wood, but because it can resist drought and has blue blossom and a lovely foliage which is red when the buds burst. The area surrounding Dokmai Garden is developing quickly, with new houses and a brand new gasoline station, café, convenient store open 24/7 and ATM about 2 km away. The transformation of the canal road into a four lane freeway will commence in 2017. Being 2 km away we can not hear the traffic, but still rapidly access civilization when needed. The canal road is already the main route between town and the Doi Inthanon national park, which we of course also visited during our short stay. It is good to once again to read Dokmai Dogma, always interesting and has been missed. Thank you Eric. Thanks Hans! We miss the lovely people of northern Thailand, farang as well. Good luck with your projects in Chiang Rai. Mention of Dahlbergia reminds me of the young plants at the forest nursery behind Royal Flora. Also rather advanced specimens of Drypetes roxburghii, Cleidion spiciflorum, Shoria roxburghii, Terminal is bellirica, Schlieshera oliveri and more. Go and ask for some to plant. Absolutely, the governmenatal nurseries have many interesting species to share, although most people only request teak. There is another nursery not far from Dokmai Garden, on the road west towards the Opkhan National Park. We got many specimens from that nursery. Bring a book with Thai names so that the staff can show you what they have. Scientific names are scarce. I was told at Ob Khan National Park that the nursery west of Dokmai Garden has seedlings of Anisoptera costata, now likely extinct in the wild in Thailand north of the Mae Chem, but a handsome tree worth planting A huge one remaining S in Two in a valley with lots of Livistonias nearby. The diperocarps are truly worth collecting and preserving. Good to hear from you, Eric, and to know that you and your family are happy in Sweden, but I’m sorry to hear that you won’t be returning to Dokmai Garden. We have missed our visits there when we are in Chiang Mai, so hope you can find someone to cherish it as much as you did. Please do come back to this blog when you have time. I’d be happy to see some photos of Swedish flora. Thanks Lorri! We shall see what happens in the future. Dokmai Dogma still has 150-250 visitors a day so I believe it is a useful source to newcomers in the tropics. If I mix in too much of Swedish adventures it may not be as comprehensive. An option is to launch another blog, but there are already many garden blogs for Scandinavia and also many books, so I feel I have very little to add. At Dokmai Garden I could share entirely new experience, or well hidden scientific data or bridge the gap between cultures. I should be happy if somebody could continue this work at Dokmai Garden. Is Dokmai Garden open these days or is it closed completely? Would love to visit there. I have no expertise in these botanical matters, but it would be a dream to live there. I take it expertise is needed in order to rent the place. Yes, sorry, it is closed.